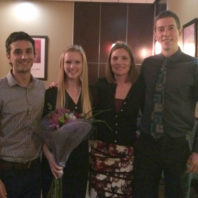 Six students at Washington State University were crowned champions of WSU’s Fifth Annual Global Case Competition, Friday, April 10, 2015. The victorious group, under the name Team Verde, consists of a pair of graduate students from the WSU Spokane campus, team captain Emma Henselbecker and Sara Dumit, as well as four undergraduates from Pullman, Brandon Hernandez-Cantu, Emelia Stephan, Kimberly Rogers and Ivan Valdovinos. The faculty advisor is Grant Norton of the Honors College. This year’s case centers on plastic waste in Manaus, Brazil with over 120 participants. Five finalist teams were selected to present their solutions to a panel of judges. Team Verde members will now have the opportunity to travel to Brazil for further study. The second place team, Cougar Cogeneration, consisted of Sergio Baravalle (BSE), Annalise Miller (CAS, Math), Stephanie Gardiner (NURS, Nursing) and Philip Behrend (CAS, Math), and advised by Chuck Pezeshki (Voiland College of Architecture and Engineering) not pictured. 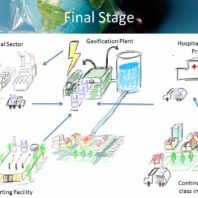 Slide 1: Briefly, while thinking about the challenge, we wanted to make sure to involve and align the main stakeholders in the community, including the poor class, middle class and industrial sector in order to solve the serious problem of plastic waste in Manaus Brazil. Slide 2: Manaus is a remote area in the middle of the Amazonas that relies on expensive energy from fossil fuels to feed its growing industry sector. 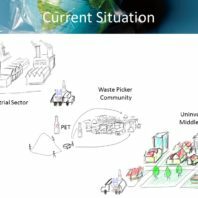 This situation creates a suitable environment for the development of sustainable and profitable solutions since relatively cheap raw materials are available to produce energy from non-recyclable plastic waste. Based on that situation and leveraging on technologies and concepts in the BSE Department, we developed a solution that is technically feasible and profitable. It considers social aspects, taking scavengers out of the landfill and providing them with a sustainable income, managing a sorting facility. We also considered a sanitary program developed by a member of our team who is studying nursing. 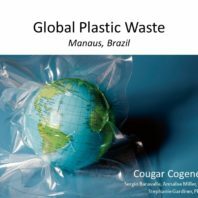 The practical solution considers the gasification of the nonrecyclable plastic in a cogeneration plant. This plant has the capacity to produce electric power while distilling polluted water for poor people that are currently drinking contaminated water. Slide 3: While we were developing the project we were aware that the scope was too large for a group of students to manage. However, we wanted to consider the situation holistically, perhaps one day working with WSU as ambassadors to Brazil. Numerous resources are available at WSU to support this endeavor. The electricity would be sold to the grid and according to our calculation and benchmarking studies, the project is profitable.